A medium size finch with a conical medium-sized bill and broad wings. There are marked differences between the sexes, with the male being more brightly coloured than the female which is rather subdued in colour. 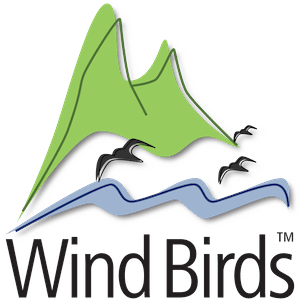 Both have white wing bars and white, broad tail-sides. Male has an orangey chest with a bluish crown and greenish-brown back. The female has a cream chest and brownish back. A typical bird for picnic tables in forestry areas in Madeira where it is normally tame. Its flight is direct, quite quick and undulating. During the flight it momentarily glides with wings closed. 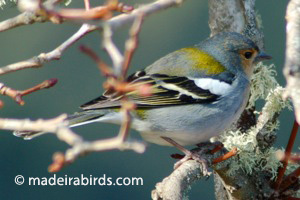 This endemic subspecies of the European Chaffinch is only found in Madeira island, at rather high altitude, being absent from the other islands in the archipelago. 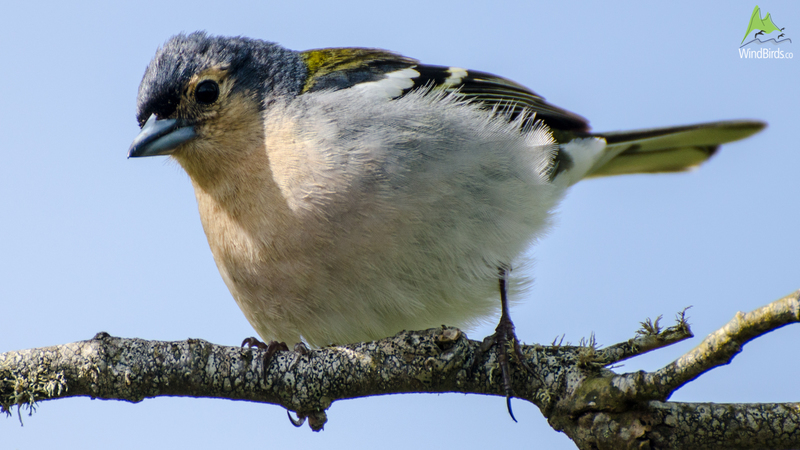 Madeiran Chaffinch is found mainly in woodlands, both indigenous and introduced forests. In the winter it is also found in cultivated areas, near rural housing. This passerine is very distinct from other with only the female Brambling having some similarity with the female Chaffinch though the first one has an all dark tail and less white on the wings. Breeding: The cup-shaped nest with an inner layer of feathers accommodates 4 to 5 eggs in a single brood between April to July. Diet: Takes seeds, shoots and berries from trees but also some caterpillar and other insects from foliage. 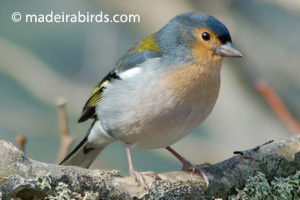 There are five endemic subspecies of Common Chaffinch in Macaronesia: one in Madeira Fringilla coelebs maderensis, one in the Azores Fringilla coelebs morelettis and three on the Canary Islands Fringilla coelebs canariensis, Fringilla coelebs palmae and Fringilla coelebs ombriosa. In the Canaries archipelago there is also an endemic species: Blue Chaffinch Fringilla teydea.